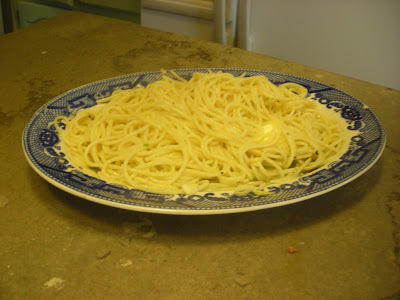 The simpliest of all ways to serve pasta -- OBG -- Olive Oil, Butter and Garlic. It's easy to do when one gets home late and we're hungry. 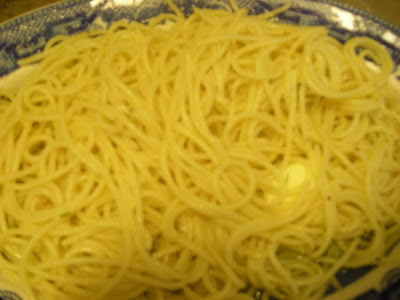 Boil some pasta (I prefer spaghetti but Husband Jim prefers angel hair) and toss with butter, olive oil and garlic. A big sprinkle of Parmesan cheese and dinner is ready. Husband Jim is a purist and prefers just the three ingredients. I feel it needs color and so will mince some parsley to sprinkle on top. Obviously, today Husband won -- no green on our pasta! We both think of it not only as a quick meal but as a comfort meal as well. Martha......we do the same. Sometimes the simpler and faster dinners always taste good. We just add a green salad and some bottled dressing and we are all set for dinner.... easy and fast. my kids prefer it this way rather than sauce. Looks yummy! Martha, that looks absolutely scrumptious! Simple true foods, well cooked -- nothing is better. Well, maybe a really good souffle.... only kidding! Thanks for visiting That Old House today -- I can empathize with the two mortgages burden; we had that for four months, waiting for our last house to sell after we'd already bought this one. A leap of faith that did pay off, but not after some serious nail-biting! But 3 mortgages? I can't imagine that kind of stress! My first Iris bloomed today. Hooray; it's nearly summer. Oh my your husband loves his pasta the way my husband does. He was raised on OBG on his pasta. Hubby is Italian. His Grandma used to put broccoli in it at times. My grandmother made this dish, a lot. No butter. Just olive oil and garlic. Instead of the cheese, she toasted bread crumbs that we sprinkled on top. She was a southern Italian girl born in America who didn't like cheese in any form, except ricotta. Ricotta really isn't a "cheese."